With only Day 1 in the books, the 2018 US Open has already produced its fair share of highlights. A record 67,832 fans took in a total of 64 singles matches at the USTA Billie Jean King National Tennis Center, as half of both the men’s and women’s fields were in action. Here’s a recap of the day’s top stories. Kaia Kanepi stuns Simona Halep in Armstrong opener: In the first main-draw match played on the new Louis Armstrong Stadium, former world No. 15 Kaia Kanepi delivered the shock of the day by blasting her way past world No. 1 and reigning French Open champion Simona Halep. The Estonian gained control early, winning five of the match’s first six games, and remained in command throughout, firing 26 winners in the 6-2, 6-4 upset. SEE ALSO: Former world No.15 Kaia Kanepi delivered the first shock of the 2018 US Open in the first match in Louis Armstrong Stadium, with an upset of top-seeded Simona Halep. August 27, 2018 - Serena Williams enters the stadium before her match against Magda Linette during day 1 of the 2018 US Open. August 27, 2018 - Serena Williams enters Arthur Ashe Stadium during the 2018 US Open. August 27, 2018 - Magda Linette in action against Serena Williams during the 2018 US Open. August 27, 2018 - Danielle Brooks watches Serena Williams in action against Magda Linette during the 2018 US Open. August 27, 2018 - Serena Williams and Magda Linette meet at net during the 2018 US Open. August 27, 2018 - Serena Williams reacts to winning against Magda Linette during the 2018 US Open. 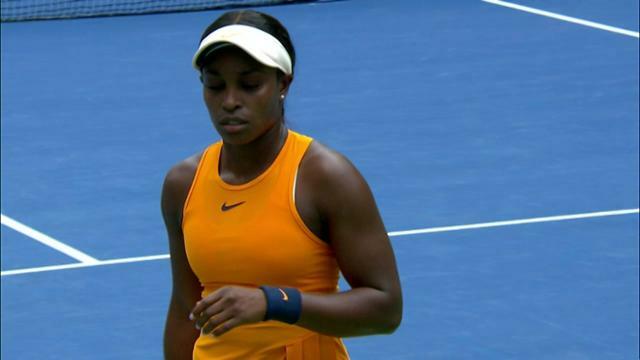 Serena makes winning comeback: Playing her first US Open as a new mom, Serena Williams returned with an emphatic 6-4, 6-0 victory over Poland’s Magda Linette in Arthur Ashe Stadium. The six-time US Open champion, who played just three matches on the North American hard-court swing this summer, was able to raise her game on the New York stage and move within one match of a potential third-round showdown with sister Venus, who advanced in three sets against Svetlana Kuznetsova in a first-round battle of former US Open champions. SEE ALSO: Serena Williams, returning to the US Open after missing most of the season last year, overpowered the veteran Pole Magda Linette, 6-4, 6-0 in her opening match. David Ferrer’s Grand Slam career ends with retirement against Rafael Nadal: The all-Spanish battle ended with a warm embrace at the net after Ferrer was forced to retire midway through the second set in the Arthur Ashe Stadium nightcap. The 36-year-old, who reached the semifinals in New York in 2007 and 2012, announced that the US Open would be the final Grand Slam of his 18-year professional career. Similarly, Germany’s Florian Mayer saw his career come to a close on Day 1, with a four-set defeat to Croatia’s Borna Coric. SEE ALSO: In a battle of Spanish compatriots, Davis Cup teammates and longtime friends, Rafael Nadal, the top seed and returning champion, defeated a hobbled David Ferrer, who was playing his last Grand Slam tournament. Kevin Anderson survives five-set thriller: The 2017 finalist found himself trailing American Ryan Harrison by two sets to one on Court 17, fighting for his tournament life against not only Harrison, but also cramps and a pro-American crowd. The South African, who squandered four set points in the second set, dug deep to make sure he was still standing tall after four hours, 14 minutes. SEE ALSO: Kevin Anderson narrowly avoided his earliest US Open exit since 2012 on Monday night, fighting off a spirited effort from home favorite Ryan Harrison to advance, 7-6, 5-7, 4-6, 6-3, 6-4. Seven former champs advance: Seven of the eight former US Open champions in action on Day 1 advanced, including defending champs Rafael Nadal and Sloane Stephens, both Williams sisters, Juan Martin del Potro, Andy Murray, and Stan Wawrinka. Kuznetsova, who was turned back by Venus Williams, was the only champ to fall. On Day 2, the theme of former champions continues, as six former trophy-winners highlight the day's play. Novak Djokovic, Roger Federer, Marin Cilic, Angelique Kerber, Maria Sharapova and Sam Stosur will all be in action, with Stosur taking on No. 2-seeded Caroline Wozniacki in the Arthur Ashe Stadium opener. 2017 finalist Madison Keys will follow Federer in the Ashe evening twin bill, while another American, Danielle Collins, takes on US Open Series Breakout Performer and Connecticut Open champion Aryna Sabalenka in a battle of rising stars on Court 5. Closing out the night session on the new Louis Armstrong Stadium will be world No. 4 Alexander Zverev. SEE ALSO: The bottom halves of both the men’s and women’s draws take top billing on Day 2 of the 2018 US Open, as first-round play wraps up with a stellar slate of tennis’ top talents in action. August 27, 2018 - Stan Wawrinka in action against Grigor Dimitrov at the 2018 US Open. August 27, 2018 - Paolo Lorenzi in action against Kyle Edmund at the 2018 US Open. August 27, 2018 - Milos Raonic in action against Carlos Berlocq at the 2018 US Open. August 27, 2018 - Andy Murray in action against James Duckworth during the 2018 US Open. August 27, 2018 - John Isner in action against Bradley Klahn on Day 1 of the 2018 US Open. August 27, 2018 - Jason Kubler in action against Roberto Bautista Agut on Day 1 of the 2018 US Open. August 27, 2018 - Fernando Verdasco in action against Feliciano Lopez at the 2018 US Open. August 27, 2018 - A Net Generation kid participates in the ceremonial coin toss with Jack Sock and Guido Andreozzi in the Net Generation "Kids on Court" Demonstration before a match at the 2018 US Open. August 27, 2018 - Taylor Fritz in action against Mischa Zverev at the 2018 US Open. August 27, 2018 - Andy Murray in action against James Duckworth at the 2018 US Open. August 27, 2018 - Nicolas Jarry in action against Peter Gojowczyk at the 2018 US Open. August 27, 2018 - Steve Johnson in action against Denis Istomin during the 2018 US Open. August 27, 2018 - Denis Shapovalov in action against Felix Auger-Aliassime at the 2018 US Open. August 27, 2018 - Dominic Thiem in action against Mirza Basic during the 2018 US Open. August 27, 2018 - Lukas Lacko in action against Vasek Pospisil on Day 1 of the 2018 US Open. August 27, 2018 - Stefanos Tsitsipas in action against Tommy Robredo during the 2018 US Open. August 27, 2018 - Juan Martin Del Potro in action against Donald Young during the 2018 US Open.